I am honored to serve as Judge of Dallas County Criminal Court #2. I am up for RE-ELECTION in March 2018 – I would love your support! 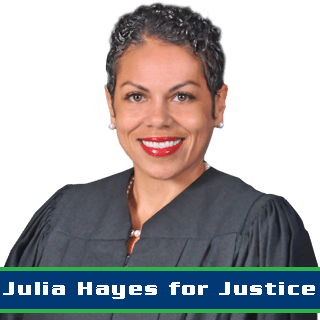 Julia Hayes was elected to serve as Judge of Dallas County Criminal Court #2 in 2010. Judge Hayes earned her Juris Doctor degree from Syracuse University, College of Law, in 2001. She attended the University of California, where she received a Bachelor of Arts degree in English. After graduation from law school, Judge Hayes clerked with the United States Department of Education; Office for Civil Rights: Dallas, Texas where she investigated allegations of discrimination in federally funded educational institutions in five states. She also worked at the University of Texas, Dallas where she managed the University’s Technology Transfer Division of the Research and Graduate Education Program. Prior to taking the bench, Judge Hayes operated her own law firm, practicing criminal and family law. Over the years, she has been a member of the American Bar Association, Dallas Bar Association, Dallas Black Criminal Bar Association, JL Turner Legal Association, the Texas Criminal Defense Lawyers Association, and the Texas Young Lawyers Association.